With smaller rocks along the coastline at low tide near Cape d'Or in Nova Scotia, Canada, the rock cliffs begins to rise where you can look over the horizon for miles around. 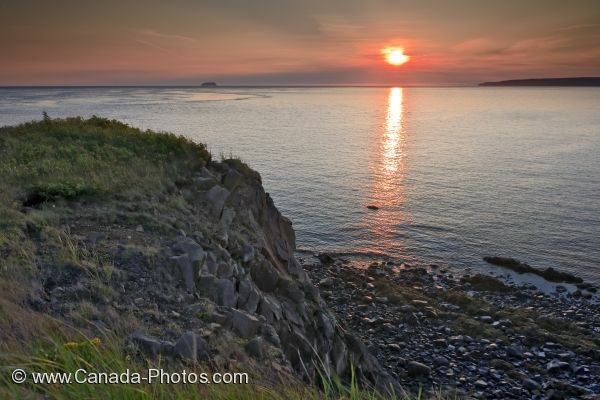 The sun gives off a yellow beam that crosses the water reaching the coastline of Cape d'Or in Nova Scotia. Dramatic coastline seen from the Cape d'Or Lighthouse, Cape d'Or, Cape Chignecto, Bay of Fundy, Fundy Shore Ecotour, Glooscap Trail, Highway 209, Minas Channel, Nova Scotia, Canada. Picture of the scenic coastline of Cape d'Or in Nova Scotia, Canada during the sunset hours when the sky sparkles with color.